Gordon & Rumsby - News- Hello...Is It Tea You`re Looking For...? Hello...Is It Tea You"re Looking For...? It`s been a rather embarrassingly long time since we did a G&R News post - sorry about that! What we aren`t sorry about on the other hand, is participating in The World`s Biggest Coffee Morning for Macmillan Cancer Support. We`ll be holding our very own (smaller scale!) 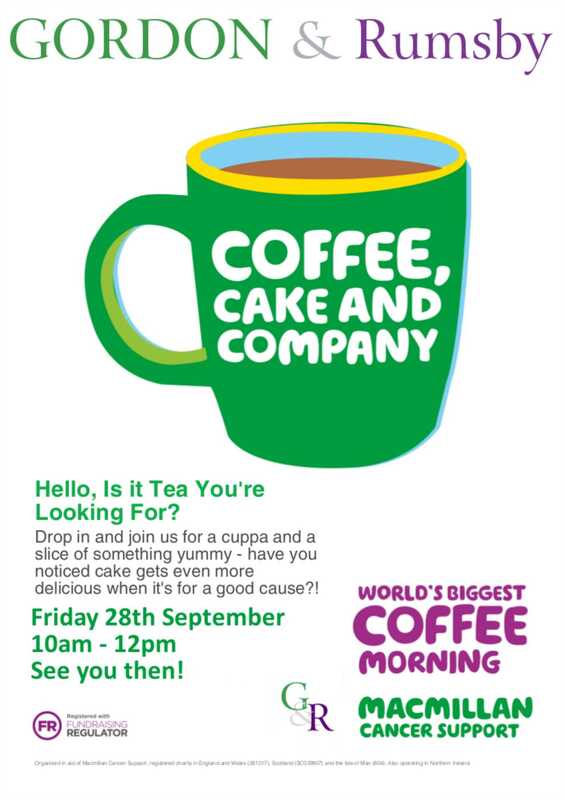 coffee morning at our office on 28th September from 10am. Do pop in, we would love to see you for a cuppa and a chat, all for an extremely worthy cause (not that we need a cause for tea and cake, it just makes it extra delicious)!